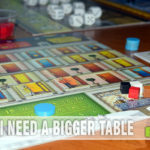 We have regularly discussed how important it is to incorporate board games into family life. A couple weeks ago, I even included it in the list of ideas for family bonding because we feel that strongly about it. Each year during the holidays, we offer various gift guides filled with games for kids as well as family games. We even put together a list of junior themed board games to start kids off early. And let’s be honest, it’s not just about playing games. It’s ALSO about enjoying the games when we play them. Apparently we aren’t alone in this sentiment. My Little Scythe from Stonemaier Games was inspired by their hit strategy game, Scythe. The difference is that it’s designed for a younger crowd with a cuter theme and festive look. 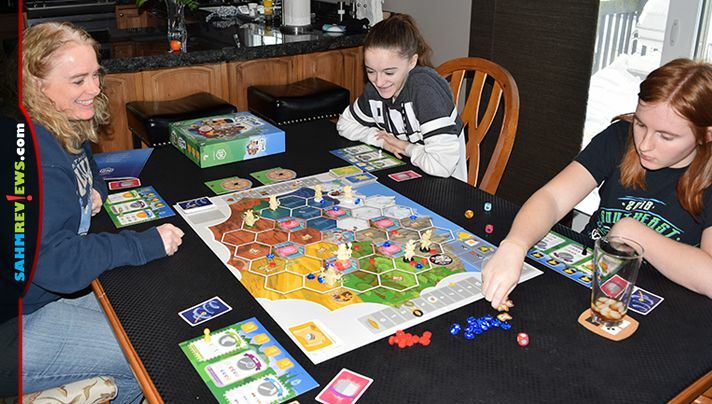 Instead of mechs, battles and conquering territories, My Little Scythe is a tournament with quests using Sibling Seekers from the animal kingdom who partake in pie fights to settle scores. Definitely more family-friendly. 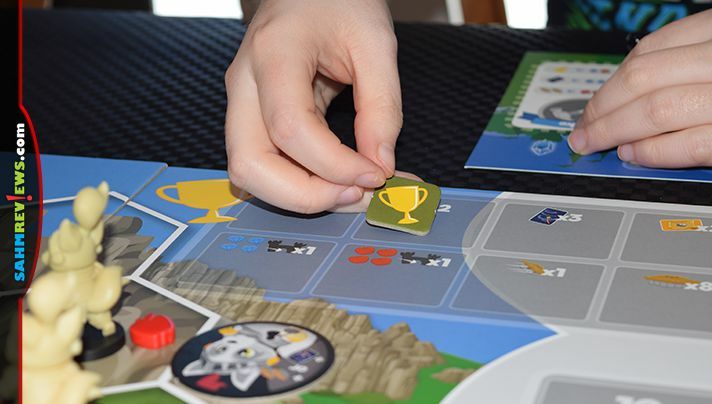 To set up the game, each player selects an animal kingdom and collects the Sibling Seekers miniatures, the base camp token, action token, the player mat and four trophy tokens. 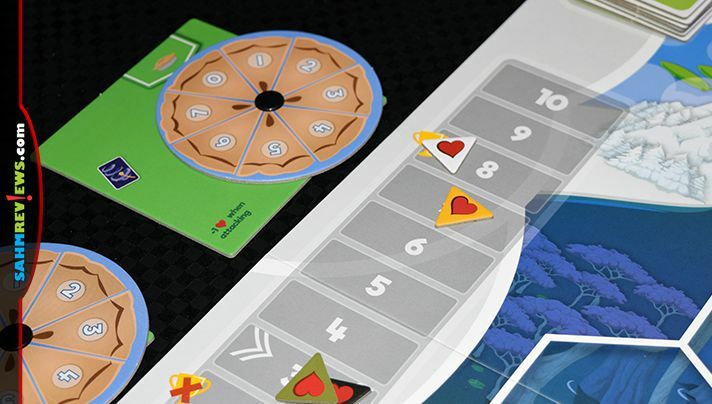 Each player takes the Pie and Friendship tokens of their color and places them on Level 3 of their respective tracks. Power Up Tiles, Quest cards and Magic Spell cards are shuffled and placed on the board to form draw piles. 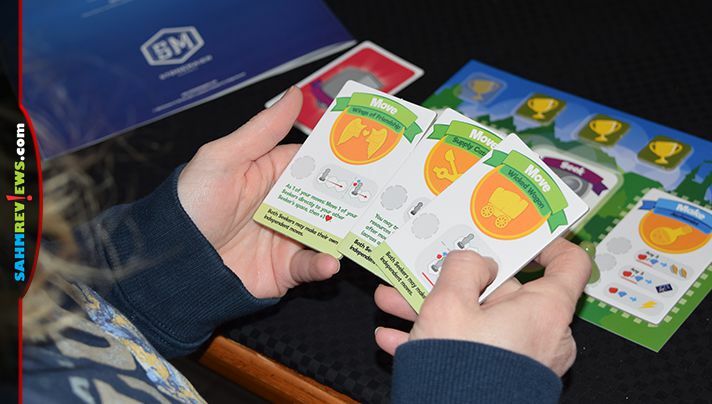 Each player draws one Magic Spell Card along with a Personality Card and keeps them secret. The goal of the game is to earn trophies for four of eight different criteria. Those include achieving the 8th level on the Pie Track or Friendship Track, earning 2 Power Ups, holding 3 Spell Cards simultaneously, making an apple or gem delivery to the Castle or winning a Pie Fight. The game is played until one player has collected four trophies at which time the Grand Finale allows other players one last opportunity to earn their final trophies. 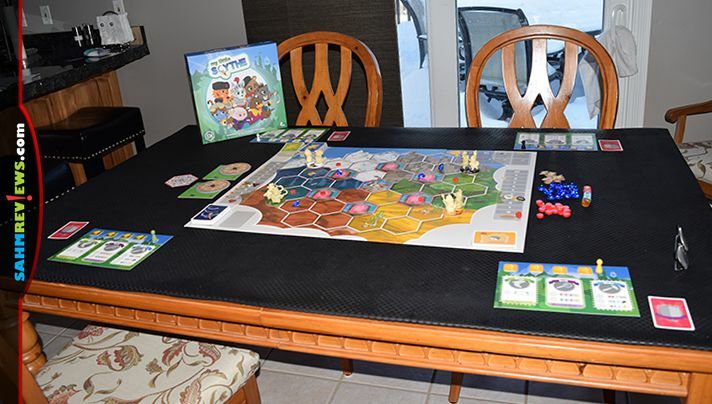 The board is divided into six different regions represented as tundra (white), mountains (grey), swamp (blue), forest (green), rock (red) and desert (yellow). 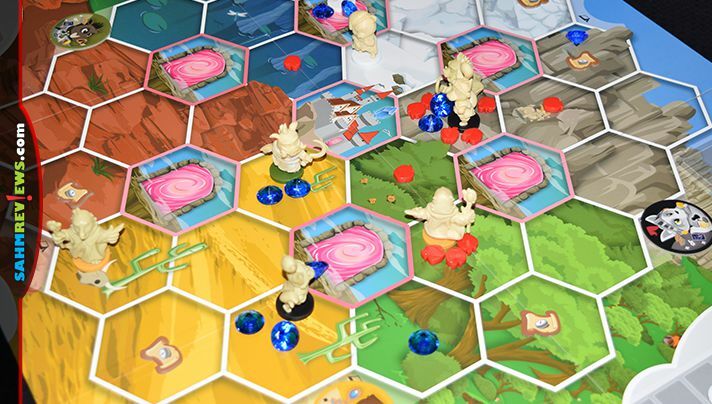 In the center of the board is the castle who is requesting deliveries of four apples or four gems. There are portals that allow the Seekers to teleport to another part of the board or to the castle if they’re able to make the proper delivery. On your turn, you may take one action. On your player mat are three sections indicating Move, Seek and Make. You will select an action each turn and it may be anything except the action you previously took. By placing your action token on the Move space, you may move each of your Seekers two spaces if they are empty-handed or one space if they’re carrying anything. 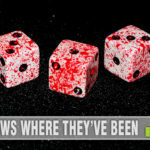 With the Seek space, you’ll opt to roll four dice (as displayed). These dice display apples, gems and quests with each side of the dice color-coordinated to represent one of the regions on the board. You’ll place the respective gem, apple or quest tokens into the regions that you rolled. While quest tokens may only be placed in unoccupied spaces, gems and apples may be placed where a Seeker is located. Because the destination is randomized by the roll of the dice, sometimes you’ll be placing them in zones where you don’t have a presence. You may opt to place on an open space, but if you decide to be nice and add gems or apples to an opponent’s space, you’ll earn friendship points. While you’re arming your opponents with the resources to utilize to earn trophies of their own, remember that reaching a Friendship level of 8 is enough to earn yourself a trophy! Finally, you may opt to take one of the Make actions. Place your action token on a space to utilize gems and apples in your possession to Bake Pies (increase your level on the pie track) or Conjure Spells (collect cards to be used in pie fights). As an alternative, you may opt to Power Up your Make or Move space. 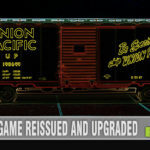 Each of these spaces may only be upgraded once per game and once you’ve completed both upgrades you’ll earn a trophy! 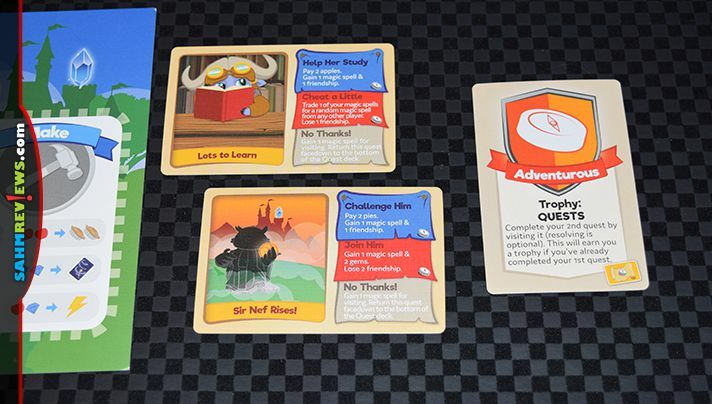 If your seeker lands on a space with a Quest Token, you may draw a Quest Card. Complete one of the options on the card and you can keep the card. If you don’t have the resources to finalize the quest, you can turn it back in for a consolation prize. It only takes two completed quests to earn a trophy! When you use the Make action to trade apples for pies, you’re not only working toward the Pie Track trophy, but you’ll also have them for battling your opponents. If you enter a space with an opponent, you’ll lose one Frienship then each participating player secretly spends pies (up to what your level is on the Pie Track) along with a Magic Spell cards. 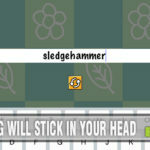 The Seeker with the highest level of pies wins the battle, earns a trophy and gets access to any resources on the space. The losing seeker returns to their Base Camp where they’re allowed to reset, giving them access to any action on their next turn. With a requirement for four of eight different trophy options, there are plenty of ways for players to attain their goals without feeling like they have to battle. By having friendly parameters, it makes the game very inviting to familes and young kids. (And moms who don’t always want to play a cut-throat game.) 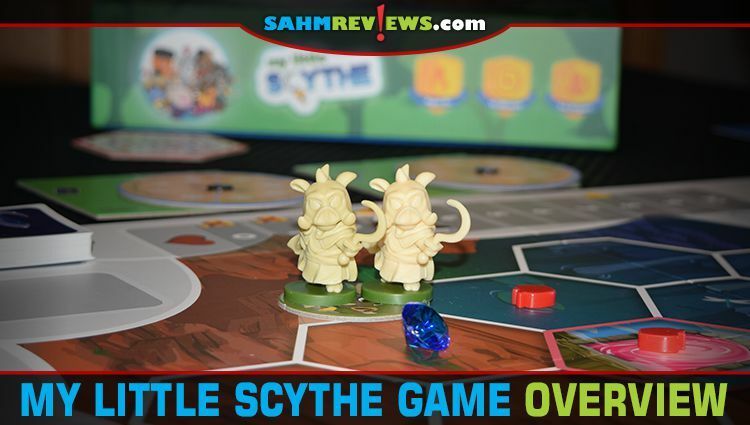 Having played both My Little Scythe and Scythe, I can see the similarities in the overall game concept and actions. 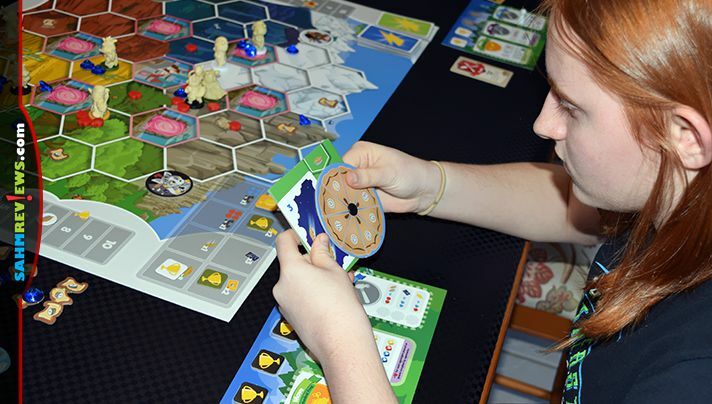 I feel that My Little Scythe is a great training tool for something who wants to learn to play the original. At under $40 on Amazon, it’s a great addition to any gamer’s library. You can also order a copy direct from Stonemaier Games or ask if your local game store carries it. Check out Stonemaier Games on Twitter and Facebook to see what else is flying into their game line! What other games would you like to see made into “My Little” versions? We haven’t played any board games in a bit. Hubby is away for 2 months and it’s just my 14 year old son and I at home. This sounds like a good game to play with the whole family. Looks like a fun game. Your wife and girls look like they are really enjoying this game! Perfect for family game night! I think we have a version of this game! I know I have seen the name before. This game seems to be so much fun! We should try it for our weekly game night! Oh wow. I bet this will be a winner in our house. It’s not complicated and boring. This game definitely looks like it would be a blast. I would love to give this one a try! I love games that make an effort to include the whole family.